For as long as I can remember, my bus has leaked a bit of oil from the front, where the engine mounts to the transmission. Its now leaking a lot, so I've finally decided to tackle the problem. I was able to get the flywheel off and now I'm looking for some advice assessing the leak. I'm comfortable replacing the main seal, but other than that. 1. It kind of looks like it may be leaking from the cam shaft plug. Is there anything that can be done about that without splitting the case? 2. What is the big hole top left side of the case? Should there be a plug in it? 3. It also looks like it might be leaking from here, is there anything that can be done about it? FYI: I have the two dowel pins not shown in the picture. They stuck in the flywheel when I took it off. I'm thinking Pyro might chime in. Me also be thinking ye may 1/2 2 split the case! If so I can help if needed! No 2ways to fix the plug leak. A split must happen. You either live with it or just go all out and if you do, might as well do it all and alright. Meaning, first machine work the case but ask for it to get inspected for cracks. If it is cracked, there is no goo that will stop the leak. If it is still a good case, then at least get it align bored and "decked" (shaving the cylinder seat to make sure they are true). Upon dismantling, inspect all parts. Cam and lifters may have to be replaced as well as any other part. May not be what you want to hear but this may be a good opportunity to do a rebuil which will last a lot long than if you were to split the case just to reseal it. Good luck! That sounds expensive, could a replacement block be purchased cheaper? The only leak that concerns me is #3. Ivan is right though in that the case needs to be split in order to fix the leaks that can be fixed. If you are going to split the case, you might as well freshen it up. I always at least put new bearings in when I split the case. Thanks for the advice Ivan. I'm not ready to split the case just yet. That will require more time, skill and money than I have right now. I cleaned everything up real well last night and and replaced the main seal. I plan on putting the rest of the engine back together over the next couple of evenings and then I'll give it a test run and see how bad the leak is. I have what it takes to run the engine before you install it. If you need help let me know and I will make myself avail!! Go with ^^^THAT^^^, Robert!!! If something else more serious than the plug is leaking, it'll save you from having to drop the engine again! 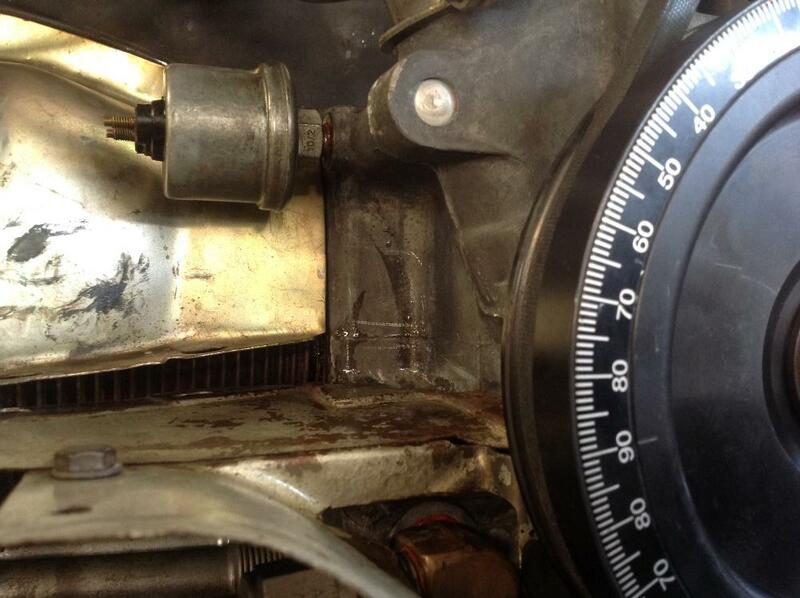 Easier to spot a leak while the engine is off. Thanks Chris, I will give you a call. How so? 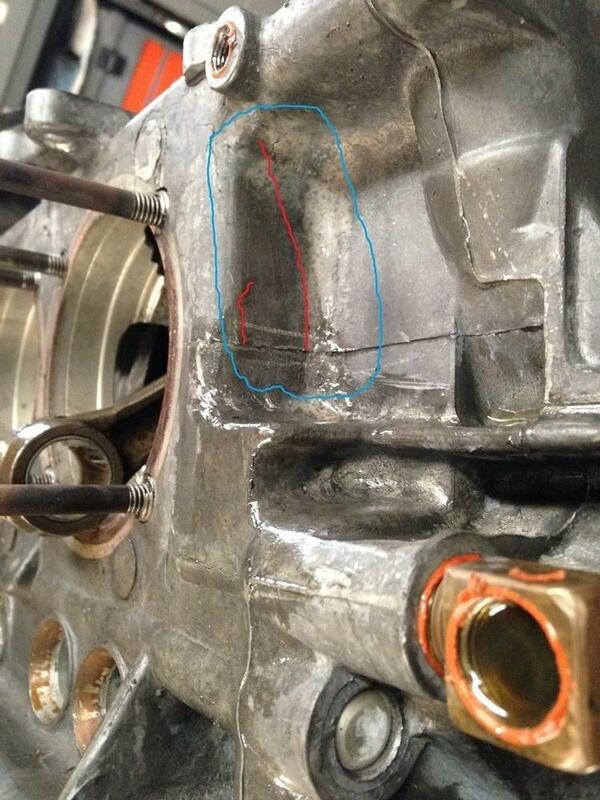 The flywheel is still on covering all the leak points he has mentioned. Wash it. Fire it up. Run it for a bit. 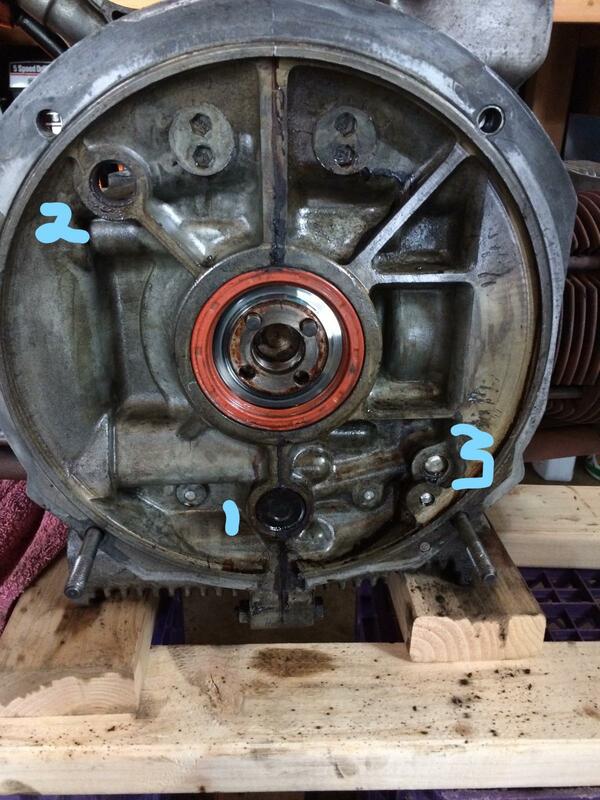 If leak shows up again, remove the flywheel. Inspect. Tip: Use your brain or someone will use it for you! So you could do the same thing with the engine IN the bus. You just have to remove it from the bus rather than the engine stand. Anyways, good luck the leak Rob. Friday morn we are starting the engine out of the bus. We should be able to let it run 15-20 min! Run it for less than 10 minutes without the tins. That way you'll be able to see any leaks easier and quicker! That's also why I like to start my engines "naked"! Now, before you get your minds into the gutter, I mean to run it WITHOUT the engine tin! That way you can assure there are no funky oil leaks and if there are, then they can be addressed on the spot. Of course that requires the install of the carb/manifold to then remove it and assemble the rest of it all, but it's always better than having to disassemble to find the actual source of the leak. So you are firing it on the test stand. Do you have ALL of the tin installed? When I test mine on the stand I run them without the cylinder tin as well as the fanshroud. This way I can spot the inmediate source of any leaks. I fired up one recently and after idling for a few seconds I revved it up and it "popped" the oil cooler at the very top! You should have seen the "beautiful" oil fountain coming out of it. That was a sure sign of extremely high oil pressure from a stuck relief valve. Fixed the valve, replaced the cooler and it worked for quite a while. Now, if I had all the tin installed (and in the bus) not only would that have created a huge mess but it would have been very difficult to find out where the leak came from. My "new" cased 1835 was retired specifically because it developed a crack over the oil galley just under the cooler. Nearly impossible to fix, at a constant seepage I could not stand it any more. Real shame since it was running as good as ever. If your running without the fan shroud, do you just have the alternator strapped to the stand without the fan attached? Removing the cylinder tin is straight forward, but disassembling the alternator is a major PITA. Since the fan shroud normally screws into the cylinder tin, would it be ok to run the engine with the fan shroud on but no cylinder tin? I think what Ivan is saying is to run the engine as a long block. No tins or shrouds. The alternator or generator is not needed for this test.